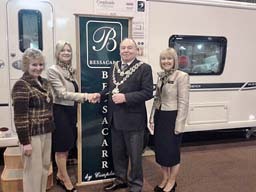 Another great October NEC show for Bessacarr dealer Couplands Caravans! 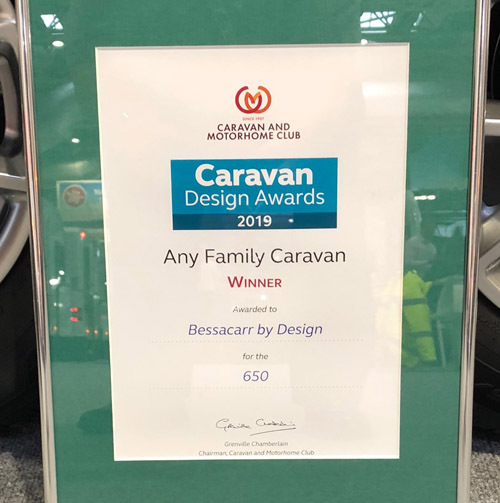 This year , for the first time the Couplands team has received Manufacturer's Awards; for both the 4-birth Bessacarr-by-design 560 and the Bessacarr-by-design 650. Another great show for sales of Bessacarr Caravans at the October 2017 Motorhome and Caravan Show. The caravans looke spectacular, and one visitor told the author that he had tramped round the show for 2 days and realised that the Bessacarrs were the best. To cap it all Couplands were awarded 'Best in Show' for the 495 and the 565. The Bessaacrr Owners Club was again supporting Couplands on the the stand and several members were moved to place orders for the new models! It was another outstanding week for sales of new Bessacarr caravans at the Motorhome and Caravan show at Birmingham's NEC, 1-16 October 2016. Once again, customer orders at the show exceeded all expectations and additional production is having to be scheduled to accommodate demand. 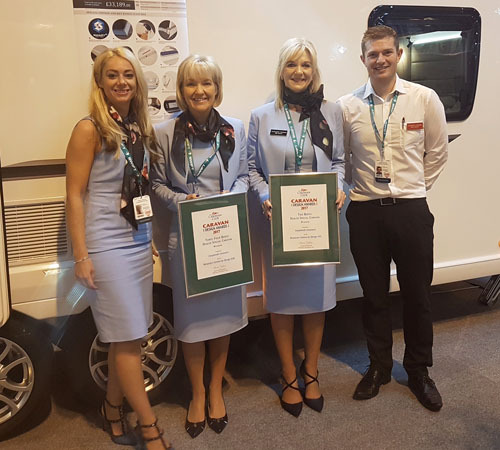 And to cap it all off, Couplands Caravans were again award Best Dealer Special, this year for both 2 berth (with the Cameo 495) and 3/4 berth (with the Cameo 580). Bessacarr Owners Club members were again present on the stand in a supporting role and reported that there was a real buzz every day but it was 'absolutely manic' on Saturday, for which 27 thousand advance tickets had been sold, not including those who turned up on the day. It was a truly exceptional week at the NEC for Couplands and the Bessacarr By Design 2015 Range. By the end of the show, approximately 70% of the newly-designed Smart HT models planned for 2015 had already been sold. In particular the “580” layout (single axle, transverse island bed) exceeded all expectations and additional production orders are having to be placed to accommodate demand. The more traditional Cameo 495 and 525 layouts also performed strongly, along with the twin axle 645. 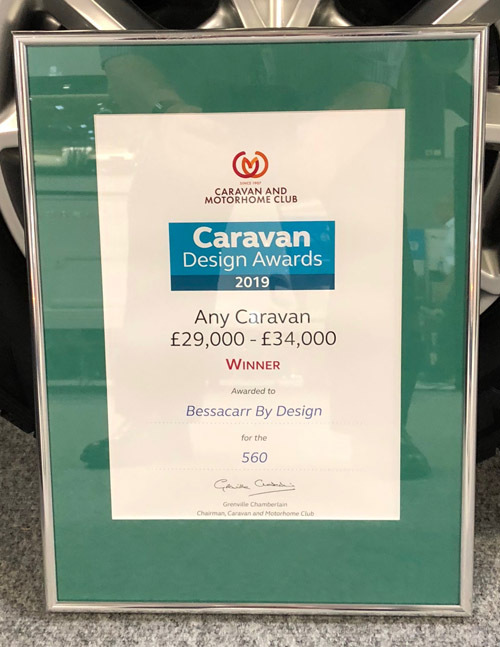 Couplands Caravans came out on top at the recent Caravan Club Design Awards where the Bessacarr Cameo by Design won first prize in the prestigious 'Any Dealer Special Category'. Bessacarr has long been revered as a brand for the touring connoisseur. The Bessacarr by Design range reflects this, and is a luxury range that comes with an outstanding specification. Swift Group would like to congratulate Couplands on their success. The Bessacarr by Design range is built exclusively for Couplands by Swift Group and utilises Swift’s highly innovative and award-winning SMART HT construction, and this latest award is testament to the fantastic design and construction methods used. Coupland Caravans and its sister site, Brayford Leisure, are the sole retailers of the Bessacarr Caravan Range, based on the upmarket Swift Conqueror. How did you come to sell this range? We previously sold Bessacarrs, but when Swift Group stopped producing them in 2007, we wanted to carry the brand on. We'd established quite a following. Our first season was 2008. Does everything come factory fitted? Everything is factory-fitted or supplied. The only thing that Swift doesn't do is to apply the Paintseal coating which the Paintseal company does. What extras distinguish the Cameo from the Swift Conqueror... Are they added according to customer demand? We like to pick things that are new to the market and supply them with the Bessacarrs. We also listen to what our customers say. 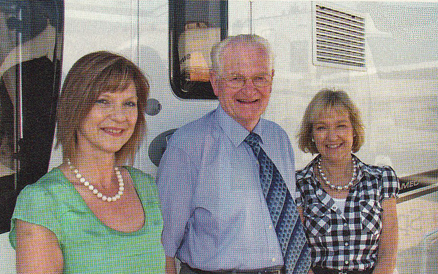 For instance, there is no dedicated cocktail cabinet in the Swift Conqueror or Sterling Elite base van, but that was something our customers wanted so the Bessacarrs have them. Extra lighting is another example. Do you have the vans in stock or do customers have to wait for them? It depends on what we have in stock, and when the caravan is purchased. At the moment we have some 645s in stock, but at another time of year we may have to wait until the next batch is built. More often than not we have to wait for them to be made. How many units do you sell per year? What are the brand values that set Bessacarr apart from the competition? Understated elegance and luxury with the best kit available. How far does the customer base stretch? The length and breadth of the UK. We've even sold to customers in Northern Ireland. Can servicing be done at any Swift or Sterling dealership in the UK? Yes. Any Swift or Sterling dealer, or Swift-approved workshop, can do the servicing. What kind of caravanners tend to buy the Bessacarr? They're mainly couples who like their home-from-home comforts and luxury, although we have sold a few Cameos to families. It's surprising how many of customers like to use the full cooking facilities in the caravan rather than going out to eat. Do they tend to favour your brand above all others, and upgarde to a newer version every few seasons? Yes. We have a good number of repeat customers, especially those among the Bessacarr Owners Club, which has a very healthy and strong following. Couplands Caravans played host to an extra-special guest at the 2013 Spring Motorhome and Caravan Show at the NEC in Birmingham - the city's Lord Mayor. Councillor John Lines is known as something of a caravan enthusiast and was no doubt in his element as he looked around the impressive array of tourers on display at the exhibition centre. He must have been well impressed with the Bessacarr Cameo range, because he ordered one during the show! BOC: To what extent have sales of the new models met your expectations this year? SB: The October show (The Motorhome and Caravan Show at the NEC in 2012) was amazing for us; the units sold far exceeded than our target, and unit sales are still running higher than the 2012 models at this stage. BOC: What do you think is the reason for that, considering the general caravan market has been rather soft for many dealers? SB: It could be our enthusiasm for the Bessacarr range! But to be frank the models this year are so good they just sell themselves, once people get a chance to see them. And just yesterday we had the Lord Mayor of Birmingham visiting the stand and he ordered one! BOC: Which models are the most successful this year? SB: Interestingly, it has been the top-of-the-range Cameo 645 (twin axle, transverse fixed bed, end wash room) that's selling the most, and it definitely has the 'wow' factor when you step inside. BOC: What has been the feedback from the new owners of 2013 models so far? SB: The response has been very positive. 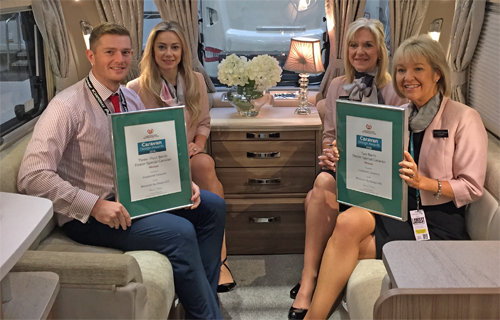 The survey resondents highlighted the 'wow factor' and the luxury of the caravans as their main reasons for the high satisfaction ratings they had given. BOC: I know that some potential buyers were at one point deterred by the fact that they were living a long way away from Louth and did not want to have to make the journey back to get their new caravan serviced. Is that still an issue? SB: Much less so now, because it is now accepted that the Bessacarr is a Swift-produced and warrantied product, and servicing can be undertaken by any Swift Dealer or Swift-approved workshop. It is still true that some smaller dealers sometimes are not enthusiastic about servicing a caravan that they haven't also sold, but that is not a Bessacarr-specific problem. A solution can be to use one of the network of Swift-approved mobile servicing technicians. BOC: Changing the subject a bit... In the Owners Club we have seen this past year several members who switched to a motorhome subsequenty returning to a caravans. Are you seeing anything like this as a dealer? SB: Yes we've noticed that too. But it appears not be the case for people who did not caravan before they bought their motorhome. They tend to stick with their motorhome choice. BOC: That's it from me. But is there anything you want to say that I haven't asked you about?! SB: Yes! I'd like to take this opportunity to say 'thank you' to the Bessacarr Owners Club for your support and enthusiasm for Couplands and the Cameo range, especially since the Bessacarr Cameo became a product defined and promoted by Couplands alone. You have helped us to make it a big success! BOC: First of all, can you share with us how sales volumes have developed since you introduced the first models in 2008, and have they met your expectations? PC: Without giving away sensitive commercial information, I can tell you that sales have been significantly higher than our first estimates. Growth has been very encouraging and we are on track to sell three times as many of the 2012 models as we sold in 2008, the first year of the programme. BOC: How do you see the model range developing, going forward? PC: To start with we only offered three models but we have progressively added to the range and we now offer six Bessacarr models, and we expect to continue to build on that. BOC: which models are you selling most of? PC: This model year, the twin-axle 625/645 fixed-bed models seem to be the most popular with customers, rather than the 525 side-dinette model which has traditionally been the favoured layout. BOC: What sort of reception has the 2012 range received? PC: In my view, the 2012 models are the best Bessacarr caravans ever, especially in terms of the quality of the interiors and the completeness of the equipment included as standard. We have started a 50-owner survey, and so far Bessacarr owners are very enthusiastic too. 98% say they would buy another Bessacarr as their next caravan. BOC: I have heard people raising the issue of having to come back to Couplands for servicing because Bessacarr caravans are only supplied by you. Is that right? PC: We find that often people prefer to have their ‘vans serviced where they bought them, but this is not mandatory! Many people find it convenient to use one of the Mobile servicing technicians who are trained and approved by Swift and will come the owner’s home to service their Bessacarr. Of course any Swift-approved dealer can service a Bessacarr, but some dealers only have capacity to service the ones they have sold. Owners should contact us if they have any problems and we will help them find a solution that suits them. BOC: Finally, looking ahead, what do you foresee for the 2013 models? PC: We have only just started to work on the Bessacarr-specific features for next year, but what I am determined to ensure is that next year’s models will still represent the most luxurious caravan you can buy at a realistic price.